American ethnomusicologist. She was educated at Radcliffe College, Cambridge, MA, in Western music history and theory with A.T. Merritt (BA 1944, MA 1946), and gained the PhD at Harvard University (1960) with a dissertation on the Song dynasty, influenced by Yang Lien-sheng and in particular by John M. Ward. 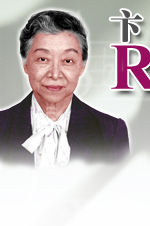 Her father, Chao Yuen Ren , a composer and linguist, has also had a significant influence upon her musical interests. She began teaching Chinese at Harvard University in 1947 while a part-time graduate student. In 1961 she also joined the music department, teaching Chinese music. She was made professor of East Asian languages and civilizations and professor of music in 1974, until her retirement, when she was made professor emeritus (1992). She was appointed fellow of the Academia Sinica in Taiwan in 1990. Her publications on Song dynasty (960–1279) musical sources, Peking opera, Peking drum songs and other historical and contemporary genres provide not only a wealth of musical data and analytical insights, but also illustrate diverse methods and issues in music studies. Her teaching at Harvard University, public lectures in China (Mainland China, Hong Kong and Taiwan) and informal discussions in her home in Cambridge, MA, a place where scholars often gathered, inspired generations of students of Chinese music. Since the late 1970s, Pian travelled to China regularly, bringing the latest Western ideas and publications there, and returning to America with a wealth of fieldwork data and audio-visual recordings, materials that preserve and illustrate Chinese music to American audiences. As a teacher of Chinese language she was also able to examine narrative singing and other oral and performing literature of China as expressions that are both verbal and musical.